Today's screening was The Assassination of Jesse James by the Coward Robert Ford (a title almost as long as my movie to-do list...) starring Clooney pal Brad Pitt and Ben Affleck's little bro, Casey. Pitt is terrific as the alternately sociable and then psychopathic robber/killer/legend Jesse James and Casey Affleck finally breaks out of "supporting role" mold giving a great performance as Robert Ford, the young man who idolized, stalked and eventually killed James. Sort of the Mark David Chapman of his day. Affleck, who also has a starring role in his brother's directorial debut, Gone Baby Gone, convincingly portrays the awkwardness and hero worship that turns into his own obsession with fame. And it is the obsession with fame and celebrity which is the underlying theme of the film. It's not so much about the wild west or exploits of the James gang--but rather the fascination with celebrity and the price of fame--or in this case, infamy. At one point in the movie, Bob Ford recounts how he has read and re-read nickel books about Jesse's adventures. Jesse counters, "They're all lies." Bob expects fame, respect and even applause when he kills the deadly James. Instead, he is branded a "coward" for betraying his one-time friend and mentor--and for shooting him in the back. Ironic, since most of James' murders were committed the same way. He is stunned to find that the population that deified Jesse is all too ready to crucify him. Written and directed by Andrew Dominik who, along with DP Roger Deakins, artfully captures the moody, brooding and melancholy of his title character in the tone and texture of the story. The stark landscapes, period costumes and sparse dialogue add to the feeling of authenticity. Its artistry and darkness reminded me somewhat of McCabe and Mrs. Miller. Nick Cave (along with Warren Ellis) provides the original music--and has a cameo as a saloon troubadour singing about the cowardly Robert Ford. In addition to talented, but lesser known actors like Garret Dillahunt and Paul Schneider, there are some more well-known names as well. Mary Louise-Parker is sadly underutilized as James' loyal wife (isn't that the way it almost always goes with women's roles in westerns? ), Sam Shepard plays a cantankerous and taciturn Frank James--Jesse's older brother, James Carville (yep--THAT James Carville) shows up as the Governor of Missouri and Zooey Deschanel pops up for a small role at the end as a showgirl (more singing roles for this girl, please!) who gains Ford's confidence. But the stand-out supporting performance is definitely Sam Rockwell as Bob's brother Charly--who comes close to living up to his amazing turn as Chuck Barris in Confessions of a Dangerous Mind. With a running time of 2 hours and 40 minutes, the film's deliberate pacing at times seems to drag. Part of the length of the film can be attributed to the story focusing not only on the relationship between James and Ford, but fleshing out fully dimensional characters for the supporting actors as well. Despite the sometimes agonizing pace, I enjoyed the subplots of the other characters as much the main story. My other issue was the voiceover narration. I don't have a problem with voiceover in general--as long as it's terse and smart. But often I felt myself wanting to be SHOWN instead of TOLD, and at other times the narration just seemed superfluous. In this film, James is neither hero nor villain, but a complex and flawed human. Multi-faceted and full of contradictions--a thief with a mean streak, a charismatic figure, cold-blooded killer, family man. To his credit, Pitt is able to portray both the fascinating and repulsive parts of his character's personality. And Affleck achingly conveys his overwhelming desire for renown--even at the expense of his own soul. 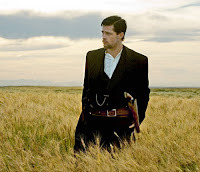 Ultimately the film in neither about Jesse James or Robert Ford--but about how we as a society value celebrity and assign it to those who have little reason to be celebrated.